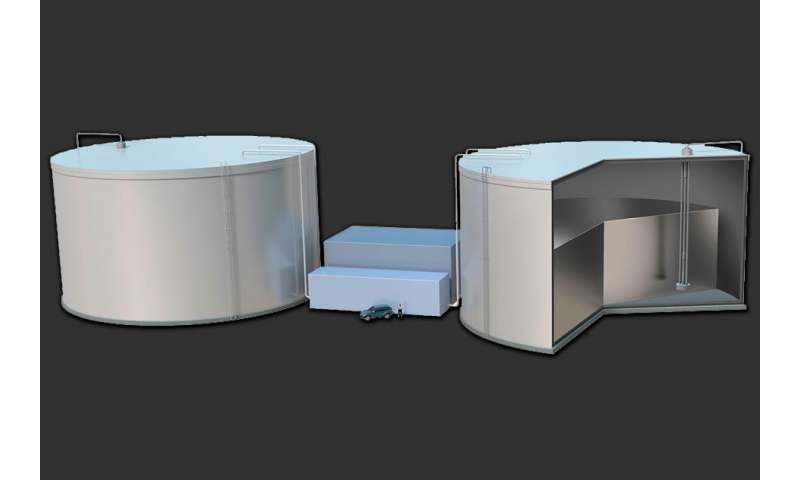 The new design stores heat generated by excess electricity from solar or wind power in large tanks of white-hot molten silicon, and then converts the light from the glowing metal back into electricity when it's needed. The researchers estimate that such a system would be vastly more affordable than lithium-ion batteries, which have been proposed as a viable, though expensive, method to store renewable energy. They also estimate that the system would cost about half as much as pumped hydroelectric storage—the cheapest form of grid-scale energy storage to date. Concentrated solar plants store solar heat in large tanks filled with molten salt, which is heated to high temperatures of about 1,000 degrees Fahrenheit. When electricity is needed, the hot salt is pumped through a heat exchanger, which transfers the salt's heat into steam. A turbine then turns that steam into electricity. However, if operators were to heat the salt much beyond current temperatures, the salt would corrode the stainless steel tanks in which it's stored. So Henry's team looked for a medium other than salt that might store heat at much higher temperatures. They initially proposed a liquid metal and eventually settled on silicon—the most abundant metal on Earth, which can withstand incredibly high temperatures of over 4,000 degrees Fahrenheit. Last year, the team developed a pump that could withstand such blistering heat, and could conceivably pump liquid silicon through a renewable storage system. The pump has the highest heat tolerance on record—a feat that is noted in "The Guiness Book of World Records." Since that development, the team has been designing an energy storage system that could incorporate such a high-temperature pump. 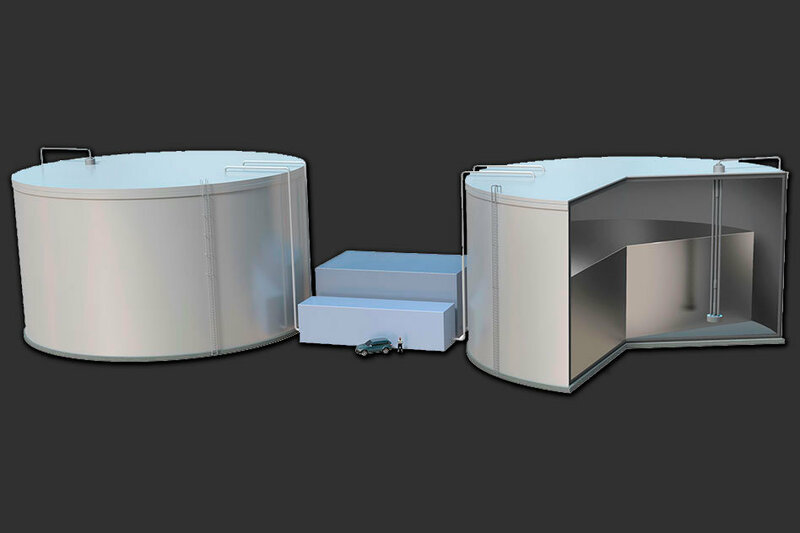 Now, the researchers have outlined their concept for a new renewable energy storage system, which they call TEGS-MPV, for Thermal Energy Grid Storage-Multi-Junction Photovoltaics. Instead of using fields of mirrors and a central tower to concentrate heat, they propose converting electricity generated by any renewable source, such as sunlight or wind, into thermal energy, via joule heating—a process by which an electric current passes through a heating element. The system would consist of a large, heavily insulated, 10-meter-wide tank made from graphite and filled with liquid silicon, kept at a "cold" temperature of almost 3,500 degrees Fahrenheit. A bank of tubes, exposed to heating elements, then connects this cold tank to a second, "hot" tank. When electricity from the town's solar cells comes into the system, this energy is converted to heat in the heating elements. Meanwhile, liquid silicon is pumped out of the cold tank and further heats up as it passes through the bank of tubes exposed to the heating elements, and into the hot tank, where the thermal energy is now stored at a much higher temperature of about 4,300 F.
When electricity is needed, say, after the sun has set, the hot liquid silicon—so hot that it's glowing white—is pumped through an array of tubes that emit that light. Specialized solar cells, known as multijunction photovoltaics, then turn that light into electricity, which can be supplied to the town's grid. The now-cooled silicon can be pumped back into the cold tank until the next round of storage—acting effectively as a large rechargeable battery. "One of the affectionate names people have started calling our concept, is 'sun in a box,' which was coined by my colleague Shannon Yee at Georgia Tech," Henry says. "It's basically an extremely intense light source that's all contained in a box that traps the heat." "It sticks to the graphite and forms a protective layer, preventing further reaction," Henry says. "So you can build this tank out of graphite and it won't get corroded by the silicon." The group also found a way around another challenge: As the system's tanks would have to be very large, it would be impossible to build them from a single piece of graphite. If they were instead made from multiple pieces, these would have to be sealed in such a way to prevent the molten liquid from leaking out. In their paper, the researchers demonstrated that they could prevent any leaks by screwing pieces of graphite together with carbon fiber bolts and sealing them with grafoil—flexible graphite that acts as a high-temperature sealant. Henry emphasizes that the system's design is geographically unlimited, meaning that it can be sited anywhere, regardless of a location's landscape. This is in contrast to pumped hydroelectric—currently the cheapest form of energy storage, which requires locations that can accommodate large waterfalls and dams, in order to store energy from falling water.